It’s time to accept a Hillary Clinton primary victory and applaud Bernie Sanders for what he’s done. Even when I disagreed with his policies, I believe that throughout his candidacy Sanders has consistently exhibited an unshakable conviction in his principles of equality, both social and economic. I admire that Sanders inspired millions of Americans to engage in the political process who previously exhibited little enthusiasm for politics and even less for Clinton. While dark horse candidate and presumptive Republican nominee Donald Trump hijacked the Republican nomination process with a slew of controversial statements, outlandish ideas and borderline hate speech, Sanders bellowed with a level of professionalism about topics well within the bounds of human decency. However, Sanders continued involvement in the Democratic primary now increases the probability of a Trump victory. 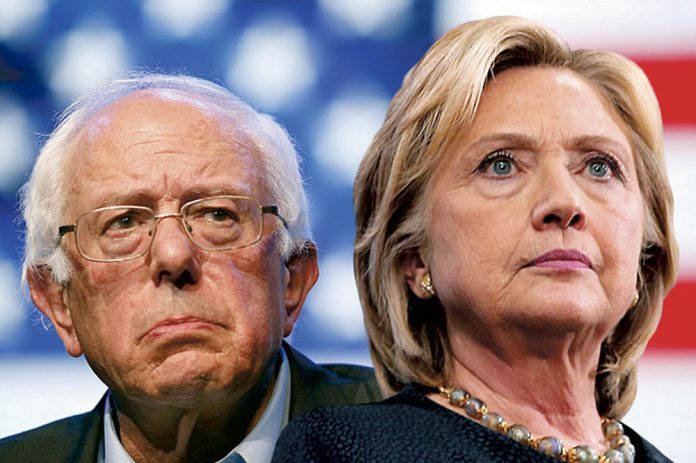 Sanders no longer has a realistic chance of winning the Democratic primary. Clinton’s huge lead over Sanders in superdelegates — party insiders unbound to any state free to vote for whomever they like — places her within 74 votes of the number of delegates necessary to win the primary. Even though the superdelegate system favors Clinton, The Washington Post estimates that Clinton leads Sanders in the popular vote by 2.9 million votes. Clinton beats Sanders by a large margin even without her superdelegate advantage. HBO’s John Oliver calculated that even huge victories in the primaries of the final six states voting in the Democratic primary on June 7 and generous manipulations of voter counts from previous states in Sanders’s favor hand him neither more regular delegates nor more of the popular vote than Clinton. Sanders lost my sympathies with his refusal to concede the primary in the face of inevitable defeat. Rather than speaking about uniting the Democratic party, Sanders continues to berate Clinton, insisting they have an unnecessary debate before the California primary while also attempting a pointless debate with Trump. Trump ultimately accepted Sanders’s offer to debate, causing Clinton to lose more time in the media spotlight. Maybe Sanders will destroy Trump in a debate, but from a campaigning perspective it makes no sense. Statistical realities make a Sanders victory virtually impossible — now he is either ignorantly promoting ideological purity over pragmatism or playing chicken with power. Whatever Sanders is doing, he seriously risks creating a political situation where Trump can easily win (and Clinton doesn’t need help doing that!). Avid Sanders supporters reject the idea that his continued presence in the race has adverse effects. Ideologically, they see Sanders’ continued involvement in the race as the only way to keep inequality, a problem many Sanders supporters believe barely crosses Clinton’s radar, the primary topic of discussion. Such a noble crusade deserved lip service when Sanders stood a chance during the primary. Now, with Clinton’s primary victory actually inevitable, Sanders continued involvement risks strengthening Trump’s case against Clinton. He wastes time, energy and Democratic political capital by continuing to invest in his campaign’s growth and momentum at Clinton’s expense. If Sanders were determined to maintain momentum he could have trumpeted the achievements of his campaign: mass grassroots mobilization of individuals, an unprecedented number of small donations, and Sander’s own meteoric rise from obscure socialist senator to household-name revolutionary. Sanders frequently addresses the many fundamental flaws within the Democratic party and the American political establishment as a whole; right now, he has the opportunity to work within the system and change it. Firmly at the helm of his organization, Sanders wields enormous influence — he could determine whether or not a huge block of Democratic voters fall into line behind Hillary after his defeat. Working outside the system as a campaign defined by the efforts of everyday people effectively built Sanders a movement. That movement failed to propel him to the Democratic nominee. Sanders and his supporters are right: our election process is ridiculous, the system worked against Sanders, and Hillary Clinton reeks of elitism. Sanders still agreed to participate in a process he knew was crazy from the beginning and only started to raise his voice in anger when it became apparent he couldn’t win. Sanders currently pursues a course where he and his supporters may still reject Clinton after she defeats him. This places Trump in a terrifyingly strong position to become our next president. Although he fell short of victory, Sanders achieved far more than anyone imagined possible; now the choice lies in his hands to either wield his newfound power effectively or destroy both the Democratic Party and himself for an essentially lost cause.